UPDATED: Mon., May 7, 2018, 10:16 a.m.
It’s Bloomsday, which means thousands of local residents will participate in an activity they do only once a year. Riding a Spokane Transit Authority bus. E. Susan Meyer, STA’s chief executive officer, expects 15,000 runners and walkers to leave their cars and trucks at home this morning and board a more inexpensive, convenient and environmentally sensitive means of travel. With the aid of 75 extra drivers and a team of volunteers assisting first-timers at STA’S park-and-ride lots, Meyer hopes to coax traditional non-coach riders into considering mass transit alternatives year-round. 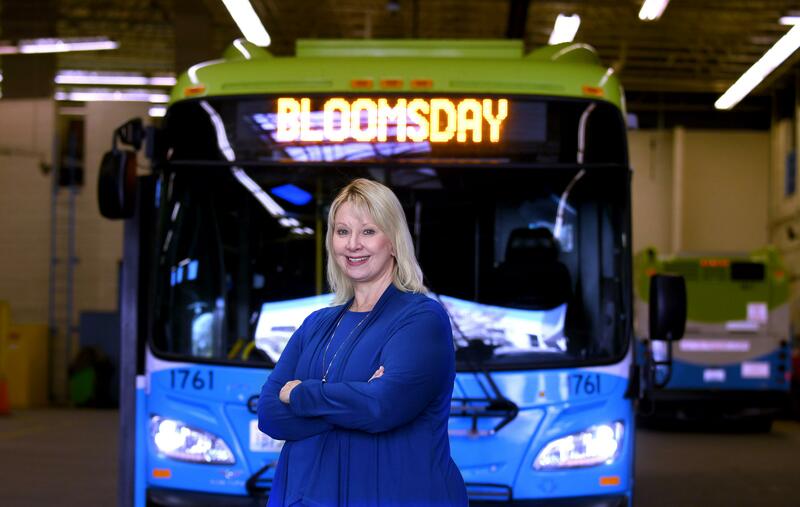 During a recent interview, she discussed washing dishes, winning over detractors, and why even motorists benefit from public transit. S-R: Where did you grow up? Meyer: I was born in Pasco. We moved to Cheney when my parents opened the Beehive Restaurant, then on to Odessa, Soap Lake, and finally, Davenport as they bought other restaurants. They divorced when I was in fourth grade, and mom kept the Davenport cafe. S-R: What was your first real job? Meyer: I washed dishes and cleaned tables when I was 9. S-R: What career did you envision for yourself? Meyer: When I was 14, I imagined someday becoming a funeral director. I knew the people who owned the local funeral home, and it seemed like a good job. The appeal may also have been driven by a good-looking high school boy who was their intern. The owners said I had to be 16 to intern, but by then I’d lost interest. S-R: What do you remember about high school? Meyer: I may have been one of the first Running Start students. In 1974, a friend and I went to the principal and said there was nothing to take in the afternoon, and we wanted to go to SFCC. We finished our two-year degrees a year after we graduated from high school. I was always in a hurry. I just wasn’t sure where I was going. Meyer: I tried selling real estate for eight months, but it was hard being only 18. People would come to my open houses and say, “Is your dad here?” I think I sold one house. I moved to Minneapolis on a whim, got a job, had a child, kept the child but not the father, and moved home to live with my parents at 21. When Heather was about two months old, I went back to college and got a degree in psychology from Eastern Washington University. Not long after that, I started working on my MBA. It took me five years, going to school at night while raising Heather and working full time at EWU on alumni relations and fundraising. S-R: And after earning your MBA? Meyer: In ’88, I got a job as administrator of Momentum, an economic development organization. After seven years, I left to work for Pacific Gas Transmission as their government-affairs person in Washington and Idaho. After that I worked at Telect in Liberty Lake as vice president of HR and corporate communications. S-R: Was there a common theme to all those jobs? Meyer: What they had in common was that I wasn’t really prepared for any of them when I was hired. S-R: That was the case again in 2005 when you were chosen to lead STA? Meyer: True. I was surprised they were interested in me, because I hadn’t been a CEO. I hadn’t been an operations director. I hadn’t been in transit. But they were looking for someone who could bring a private-sector approach to running a government agency. I learned transit after I got here. S-R: What do you remember about the early years? Meyer: STA was at a difficult point. The previous CEO had refined the organizational structure, which cost some people their jobs. But she also got a crucial ballot measure passed. She started the revolution, then I came along to start the evolution – stabilizing the organization. S-R: What sort of reception did you get? Meyer: Many employees didn’t want a business person as CEO. I got letters and phone calls saying, basically, “I was here when you came, and I’ll be here when you’re gone.” My contract was only for one year, which created an opportunity for people to try forcing me out. Once the board realized what was going on and gave me a longer-term contract, things started settling down. S-R: What have been some milestones since your arrival? Meyer: In 2007, I asked several transit leaders I’d met at a conference to come audit our organization from a quality perspective. They rode the buses, visited with managers, and after three or four days concluded we were not maintaining our vehicles well enough, and were keeping them too long. We assumed we were being good stewards, but the public got the opposite impression. Based on their recommendations, we launched a program called Quality Counts. We hired enough mechanics and cleaners to deep clean the buses every 10 weeks instead of every 20, and we hired enough coach operators so every driver could go through advanced training each year. S-R: How about more recently? Meyer: At the end of 2016, voters passed a $220 million ballot measure to fund a 10-year plan for more and better transit. S-R: Along the way, did anyone ever approach you and say something along the lines of “I was skeptical at first, but things have turned out better than I thought”? Meyer: Coach operators have told me that. Union officers don’t always agree with my decisions, but we meet with all employees every three or four months to talk about the budget, performance and projects, and I answer any questions they have. S-R: What’s STA’s annual budget? Meyer: This year, we’ll spend $73.5 million on operating expenses and $43.5 million on capital improvements. We’re a pay-as-you-go, no-debt agency, which is unusual. S-R: How about revenue sources? Meyer: A voter-approved .7 percent sales tax accounts for 75 percent of our budget. The rest comes from rider fares and federal funding. S-R: You’re seeking a major federal grant, correct? Meyer: Yes. We’re hoping to get $54 million to help pay the capital cost of a proposed 6-mile Central City Line route between Browne’s Addition and Spokane Community College. We estimate the total capital cost at $72 million. S-R: What does STA do best? Meyer: Depends on who you ask. Many taxpayers think we do best at running a cost-effective service. We have the lowest cost per ride of any large urban transit system in the state. Riders think we do best at being on time and providing good customer service. S-R: What could you do better? Meyer: Provide more service to more places. That’s what our 10-year plan includes. S-R: Is there a busiest time of year? Meyer: Winter, when people choose to ride the bus instead of driving. S-R: What’s your typical day? Meyer: Ten to 12 hours during the week, plus weekends as needed. S-R: Looking back, what’s been the biggest surprise? Meyer: I came in thinking there were too many people in administration, and that coach operators were paid too much. I was wrong on both counts. As we pursued a more aggressive plan for technology development and service expansion, we needed additional people with expertise in planning, accounting, finance and information services. And coach operators are paid competitively. They weren’t overpaid then, and they aren’t now. S-R: What’s the range of coach operator salaries? Meyer: They start at $19 an hour, and go up to $26 after six years. S-R: How long do drivers stick around? Meyer: A long time. Last week we celebrated a man who was retiring after 40 years. S-R: Who’s best suited to drive a bus? Meyer: Someone who’s easy going and likes people. Having an innate driving talent is also good, but we don’t hire people only for safe driving. We hire them because they’re good with people. S-R: When you speak to groups, what message do you try to convey? Meyer: That public transit is an essential service, like police and fire. But unlike police and fire, people who use transit help pay for it. There is value to public transit even for people who don’t use it. If 40 or 60 people are on a bus while you’re commuting to work, those people are not in cars, slowing you down. Transit helps traffic move. S-R: What could STA do to get more people riding a bus? Meyer: Provide more service to more places. But one thing that keeps people from trying us is their fear of getting on the wrong bus, or not knowing how to pay. We have a video on our website that explains that. S-R: Were you enthusiastic about public transit before joining STA? Meyer: No. I was uncomfortable around some of the people who rode the bus – people who appeared not to be employed, or had lots of little kids in tow. I came from a business background, so I had a bias I had to get over. S-R: Do you ride a bus to work now? Meyer: Sometimes. That’s why I tell people they don’t have to marry public transportation. They can just date us. Drive to work when it makes sense, and take the bus when that makes sense. Writer Michael Guilfoil can be reached at mguilfoil@comcast.net. Published: May 6, 2018, 7 a.m. Updated: May 7, 2018, 10:16 a.m.